Gijón is a coastal city in Asturias, in the northwest of Spain, with about 275,000 inhabitants. Gijon is a good place to visit because of its Roman past, its museums, its sculptures and architecture. It is a green borough, its gastronomy is unique, it offers quality commerce, and it has exceptional location next to the sea and on the center of Asturias. The weather in Gijón is not like much of the rest of Spain. Gijón is on the northern coast of Spain where it is wet and not very hot in summer. The climate of Gijón may be defined, in this sense, as being temperate, with an average annual temperature of 15 °C and only slightly varying annual average maximum and minimum temperatures. Rainfall ranges between 800-1,000 mm/year, fairly regularly distributed, with few very dry periods and no great concentration of rainfall at specific times of the year. Both variables, temperature and rainfall, are slightly modified at the southeastern border of the municipality, where the highest altitudes are to be found: the temperatures decrease and the rainfall increases. Asturias Airport (OVD) is about 40 kilometres from Gijón. You can visit the city by car, on foot, by bicycle through its bike lanes or by Segway, personal transport with autobalance. You can rent segways on the city and make guided tours around it. There are several urban and suburban bus lines in the city. A ticket costs 1.25€. During Eastern Holidays and Summer you can enjoy the city on a touristic bus which makes a route with stops on the principal tourism resources like Railway Museum, Isabel La Catolica Park, Laboral City of Culture, Botanical Gardens. As its name suggests Sweet-toothed Gijon aims at highlighting one of the citys biggest attractions, its wonderful pastries. Therefore, Gijón is known for having the largest number of bakers shops per capita in the country, something that the townspeople boast about because of their fondness for sweet treats. Thus, its pastries, cakes, and chocolate will be closer to visitors. The product, presented with authenticity and uniqueness, would create routes of associated establishments in the city with the chance to taste the specialties of each establishment. Gijón has a truly extensive range of hotels. You may choose the hotel that suits you best according to its location, in the city centre or in the surroundings, number of stars, services, etc. Among the accommodation available in Gijón, there are also outstanding country hotels, especially suitable for enjoying the peace and tranquility of the surroundings and the quality of their facilities and services. 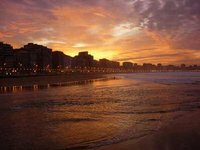 We have a comprehensive list of accommodation in Gijón searchable right here on Travellerspoint. You can use our map to quickly compare budget, mid-range or top of the range accommodation in Gijón and areas nearby. This is version 10. Last edited at 3:44 on Aug 2, 17 by sleepBot. 2 articles link to this page.